Worried about planning laws regarding the height of a standard shed? Consider the alternative option of constructing a horizontal storage shed, outdoor. 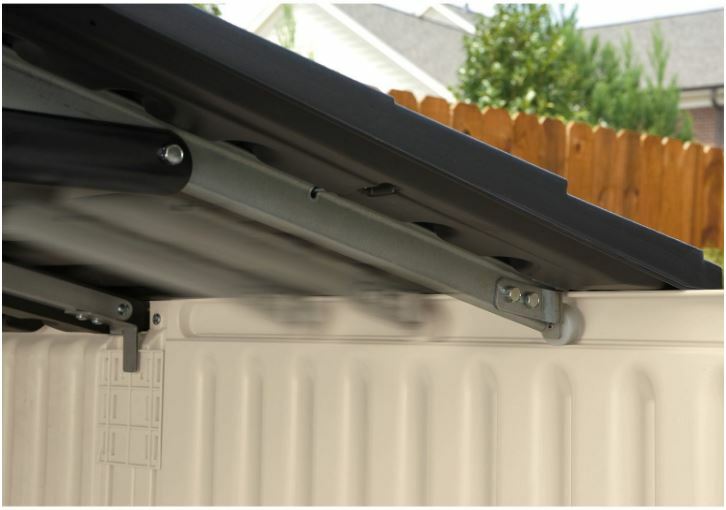 This Rubbermaid model delivers triple-way easy access inclusive of a slide-lid roof. This type of storage facility is becoming increasingly popular due to their unobtrusive mini-sized posture. Avoiding inconvenient planning regulations they alleviate construction headaches, assembly’s a picnic compared to the walk-in variety. Where space is tight these low-profile designs sit beneath the height of a garden’s typical 6 ft fence-line, many opt to situate them against a house wall as their low stature usually sits beneath the window however although many horizontal styles usually provide fairly restricted storage space, Rubbermaid’s Slide-Lid Shed enhances accommodation room to another level. Entry regards opening the double doors spanning the frontage width whilst accessing storage at the back of this unit escapes crawling in by virtue of the front half the roof sliding across the back half, enabling walking into half the shed once the triple door access is ajar. 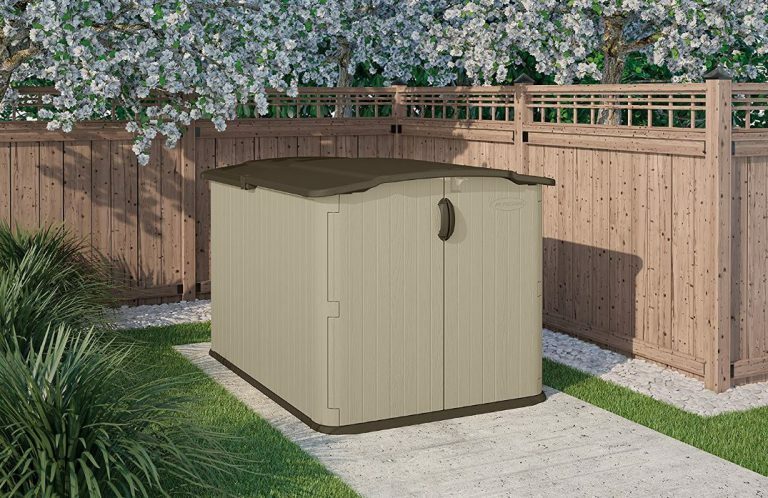 My passion concerns low-maintenance outdoor storage solutions and this beauty certainly fits the bill. A quick wash down when the grime appears is all this storage facility requires, beats the heck out of yearly re-coats of varnish & paint with the added bonus of evading future re-roofing duties too. The Slide-Lid shed displays a subtle olive/sandstone shade topped off with a stylish tiled-effect finish accentuating a modern touch of pizzazz to any a garden’s landscape. A low-key presence has become a well-favoured option where space is rather restricted, squat enough to shelter from adverse winds & hidden from view; serving the purpose of storing a whole variety of outdoor gear, reason for the increasing number of home-yards incorporating additional low height storage facilities to organise storage as opposed to the larger variety. The roof, facade and floor are manufactured from chunky polypropylene resin, described by Rubbermaid as leak proof, waterproof and resistant to denting. The muted olive/sandstone finish stylishly enhances any garden without the height standard sheds behold, the colour is best portrayed in the videos and image below rather than the images above. Wonderful access is provided by the double doors and sliding roof whilst the built-in floor maintains a clean interior, preserving storage. 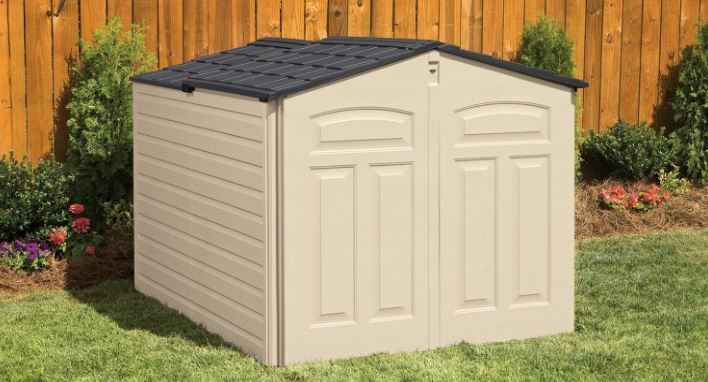 6 ft x 4 ft dimensions accommodate an increased amount of gear when comparing alternative horizontal sheds. 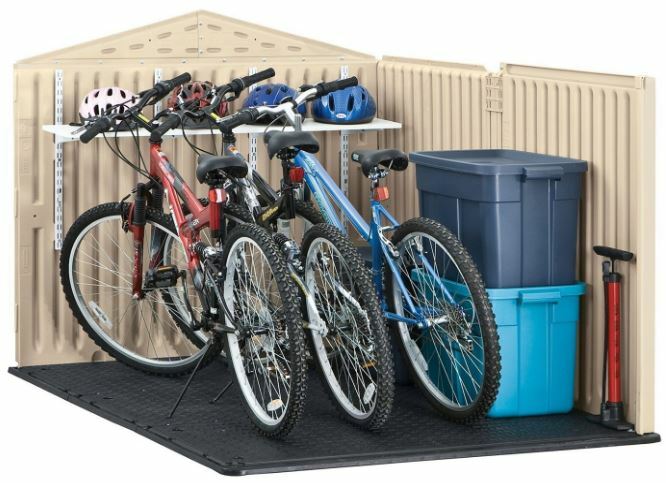 A whole variety of storage including: mowers, long handled garden tools & equipment, kids toys, bikes, mobility scooters, trash cans, wood logs, sporting equipment, lawn & plant supplies – A whole array of outdoor stuff. Although positive answers are received to accommodate a ride on mower or mobility scooter, they all vary in size. Check the internal measurements below, whether it fits the bill. A few have raised concerns regarding the sliding lid keeps jamming. I’m guessing the ones who haven’t had this issue have lubricated the sliding mechanism with the likes of WD 40 oil to maintain a sweet slide. When anything is stood outside, weather may cause the odd problem so a quick lubricated spray sounds beneficial. Another concern regards the odd disgruntled comment associated with the doors plastic hinges, many purchasers wish metal hinges had been used resulting in a sturdier operation, like Suncast’s similar Glidetop Shed which receives impeccable feedback. The make-up regards an environmentally friendly recyclable polypropylene resin composition, constructed into a robust dual-walled structure delivering sturdiness to the overall construction whilst attractive molding produces a stylish semblance of wood panelling exhibiting the neutral colours of an olive/sandstone shade, designed to complement any garden setting. The pure advantage lies within the resin mix, designed weatherproof to ensure rainwater flows off whilst the weather-resistant composition withstands decay deterioration resulting in a future absent from conservation issues regarding re-painting & re-varnishing. Quite the opposite wood structures succumb to, being susceptible to rot when exposed to damp conditions. Although rain, snow and icy conditions are catered for, sunburn is detrimental to yesterday’s plastic causing a demise in appearance through colour-fade & cracking. To counteract consequences of sunburn attack, the resin mix is UV stabilised with protection to endure the stresses and not fall victim to bleaching. Cleaning’s a breeze too, a light pressure-wash or spray-hose down works wonders whereas deep-seated dirt over a winter’s period only requires scrubbing with warm water & mild detergent, just use a soft brush to prevent marking the facade, job’s done in minutes. The walls interlock with the floor whilst adjoining the roof during assembly, enclosing the unit ensuring their weatherproof design. The chunky walled structure is described as leak proof and resistant from peeling & denting therefore withstanding that demise in appearance single skinned & flimsy metal walls get stricken with after a few knocks. Don’t think you’ll have to crawl through the 6 ft length to gain access to storage at the back of this shed, the roof slides back exposing half the shed as the image up above shows. A cleverly designed piece of kit for a shed this low. The roof’s manufacture is a resin construction, molded to represent attractive roof-tiling harbouring the same waterproof credentials the walls possess whilst designed with an adequate pitch and extension beyond the walls creates an efficient drainage system. Rollers beneath the lid simply allow the front half of the roof to roll over the back half opening up the shed for easy access. Two double doors open the entire width of the shed, rolling items in and out becomes a non issue, whilst carrying heavy items to store at the back of the shed makes accessibility very straightforward once the lid’s slid back. When the doors close and lid slides shut a unique cane bolt locking system secures the shed delivering simultaneous triple door security by means of inserting a padlock through the clasp. Padlock not included. Although we have a walk-in quality plastic shed, we’re pleasantly surprised with the advantages a built-in floor provides. Storage is kept immaculate compared to our last wooden shed, so thumbs up here. No waves of leaves entering during Autumn, no pests looking for shelter and no puddles of rainwater appearing on the shed floor results in maintaining a clean dry interior. The floor is described as heavy duty and impact resistant, it’s designed to cope with the demanding use of wheeling in heavy equipment and storing hefty items however these credentials will only suffice if the shed sits on a solid level surface; wood, concrete or paving is ideal. Wall anchors are included with this shed for fitting your own shelving. Shelving, pegboards and storage hooks can be purchased separately. Dimensions for fitting your own wooden shelves are provided in the instructions. It’s always advisable to anchor any shed down into the foundations to prevent moving in the wind. 11 recessed anchor points are embedded within the floor. You are required to purchase the correct anchor screws dependant on the foundation material, either wood or concrete. If a quick wash down for upkeep duties impresses you like it does with me, this shed certainly fits the bill. A hose down is all this shed requires to bring back the pristine appearance, the day it was assembled. Forget re-staining, re-varnishing and re-painting jobs, they’re a thing of the past. No more future re-roofing either, sounds great and it is. Purposely designed to create more time in the garden rather than rolling your sleeves up and servicing rotten wood. If you ever have a problem with dirt becoming ingrained, we find a couple of cups of white vinegar into a hot soapy bucket of water and rubbed off with a soft brush or cloth works wonders. Assembly roughly takes a few hours; who cares, take your time and make a great job. Two people are required for fitting the roof, one person to apply a bit of pressure whilst the other person aligns & secures with screws inside the shed. The instructions are clear and offer plenty of useful tips like adding washing up liquid to ease the attachment of the panels etc. It’s always a good idea to have a good read through the instructions before assembly takes place in order to become familiar with the build. Household tools construct Rubbermaid sheds however they have pictures of a power screwdriver with warnings not to over tighten some screws in fear of ruining the thread so if you opt to use a power screwdriver, set it on a low torque setting. Before assembly takes place ensure solid level foundations are prepared. Aligning the panels becomes a breeze from level footings plus the delivery of a perpendicular stance ensures the correct operation of both the doors swing and sliding roof. Ensure the foundations are raised slightly above a floodplain level to prevent standing in a flood, no shed is totally waterproof. Solidity below determines firm anchorage whilst providing the floor with a perfect base for heavy duty stresses. Wood, concrete or paving slabs provide ideal foundations, just make sure it’s level. As previously stated, 11 anchor placements require 11 anchor screws which have to be purchased separately. There’s only the Suncast Glidetop Shed that’s in competition at present when comparing low maintenance horizontal sheds with a sliding roof. Tough competition here though, it’s available in the UK and receives outstanding feedback, worth comparing. Apart from the odd niggle with the plastic hinges this Rubbermaid Slide Lid Shed is worth considering. It is up against tough competition with the Suncast Glidetop however reviews come across very favourable. If you have any related low-profile shed queries, please share & drop them in the comment section below. Always happy to help. Please share this Slide-Lid shed with your social friends. Thank you! Great reviews. After some lengthy searches for a low profile plastic/resin shed which is big enough to fit the items we want to store, yet low enough to not exceed the fence height. Rubbermaid seem to offer the solution to the problem. The disappointment is that they are not available in the UK for some reason. The closest is Sunbeam Glide top shed which I’m struggling to want to purchase for aesthetic and small capacity reasons. Any idea why they aren’t selling in the UK or if you’ve seen any large sheds which are only just below the fence line (around 185cm height)? 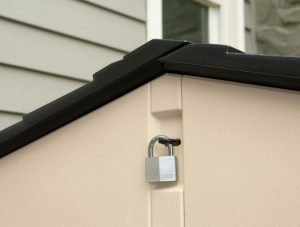 Rubbermaid’s Slide Lid Shed does look more appealing due to comprising slate style roof panelling and as you mention, the low-height positions beneath the standard garden fenceline. 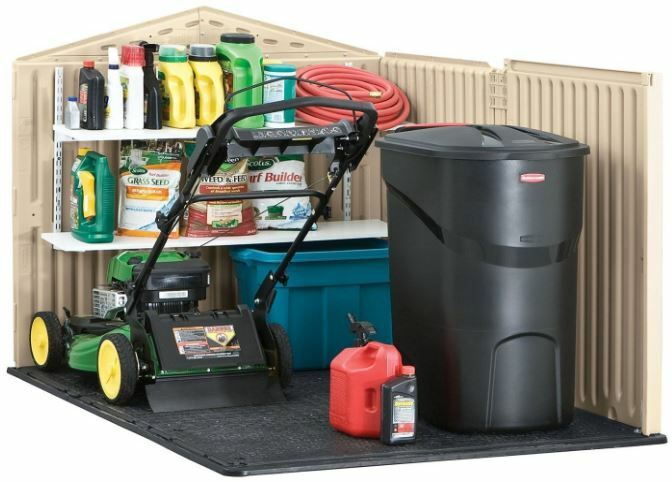 I have never been able to link this Rubbermaid shed to a store in the UK. I’m not sure whether they were ever available in the UK or not but they have been popular over in the USA. The only negative feedback I have come across is their plastic hinges can be susceptible to snapping if gale force winds swing the doors ajar. Apart from that, feedback’s okay. The Suncast version is the only competing shed I have come across comprising the same shape, height and sliding lid. 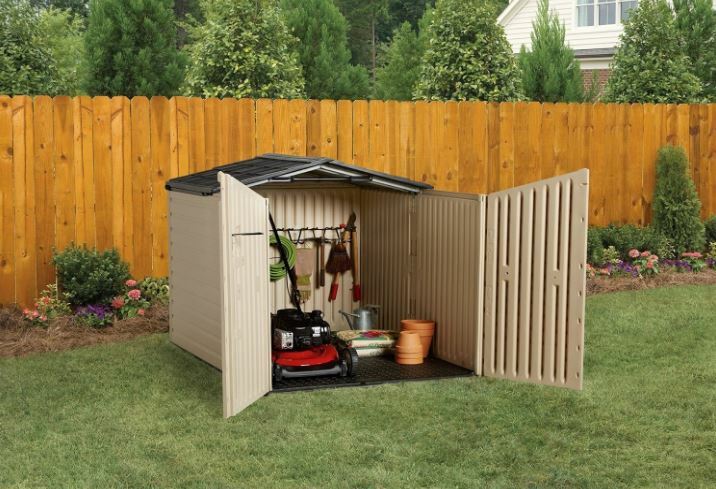 One of the most popular mini sheds is Keter’s Duotech Grande-Store which can accommodate a wide range of accessories from wheelie trash bins to gardening gear; albeit, this is probably half the size, has 2 double front doors and a lift-up lid. 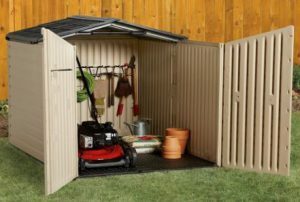 Do you have a recommendation for a low-profile shed that would hold a riding mower I have a Huska Varna with a 48 inch deck that means I need at least a 49” door entrance width. Hi Mike, I’m struggling to find anything suitable functioning a 49″ width door opening in a low profile design. Apparently Rubbermaid’s Slide Lid doors span 45.1″ according to reviews however I would always verify measurements with the seller prior to purchase. 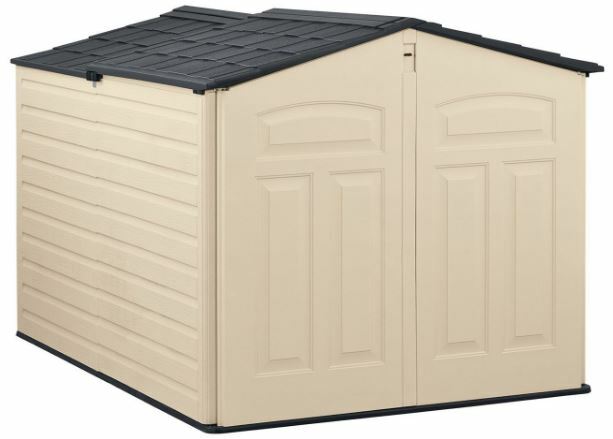 Alternatively, I was going to suggest Suncast’s Glidetop shed that receives exceptional feedback compared however the door opening is a tad short, measuring: 46-1/4 in. W x 46-1/4 in. H therefore your Huska Varna 48″ Mower will still not fit in. 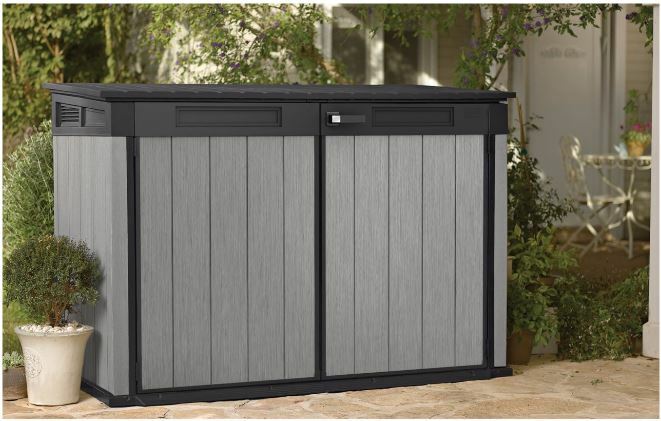 Thanks for dropping by to read about Rubbermaid’s horizontal storage sheds, outdoor. I’m glad you found this slide-lid shed article informative, images & videos do say so much more than I can ever describe, this is a very visual niche, it’s all down to what they look like as well as their build quality. 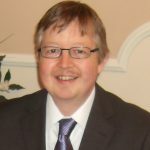 Thanks for your advice, I find visitors find the bullet point pros and cons section instantly delivers their key points of interest but I have taken on-board everything you say, thanks! 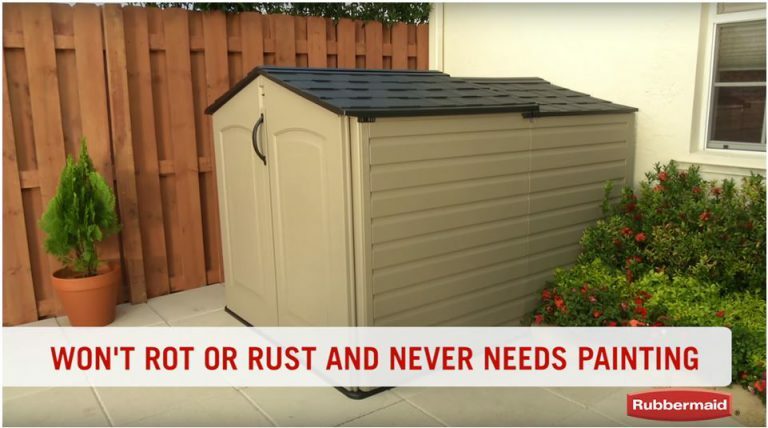 Thanks for asking about Rubbermaid Help but we don’t sell any sheds / horizontal sheds or low maintenance outdoor storage solutions, so we are unable to send parts and replacements. This website regards sharing the many varieties and styles for visitors to take a look at and inspect, we have no allegiance to any manufacturer. You will have to select a country, choose USA if your country isn’t available, scroll down to the bottom of the page and select contact, then tell them about your situation and explain what you think is missing. 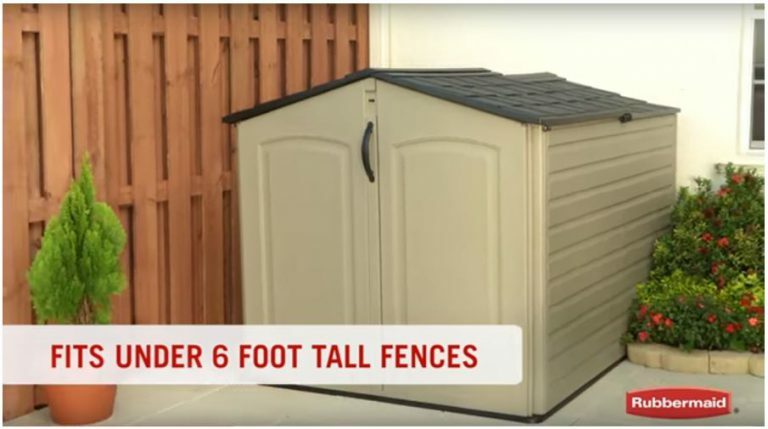 This shed sounds like it would solve many issues homeowners have with their storage problems. It is big enough to allow for a fair amount of storage but small enough that you will not need a work permit to put it up. I really like the height of the shed and I am really impressed with the pull back roof. The only thing that concerns me is how well can the plastic floor be anchored? We live in a very windy area and have lost more than one outdoor shelter. 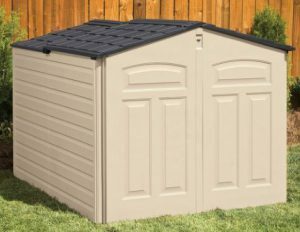 Thanks for visiting and reading about this Rubbermaid horizontal shed. Yeah, many people choose a low height shed to get around building code problems however this doesn’t seem to be too much of an issue in the UK compared with the USA where plastic sheds are concerned. The slide lid roof is a great feature, simplifying the storage of items at the back of the unit plus you have wide double door access too, spanning the width of the shed. Down in the floor there are 11 anchor positions embedded within the floor. You do require the correct anchor bolts dependant on whether you have concrete or wooden foundations, this is plentiful for a shed these dimensions. If you do receive severe wind storms I would recommend sheltering the shed by situating it next to a fence or house wall as the low height sat beneath will provide the shelter and this is why it’s designed this way.